Thankfully, our vending machine rarely stocks Rice Krispie Treats, or else I'd be in real trouble. 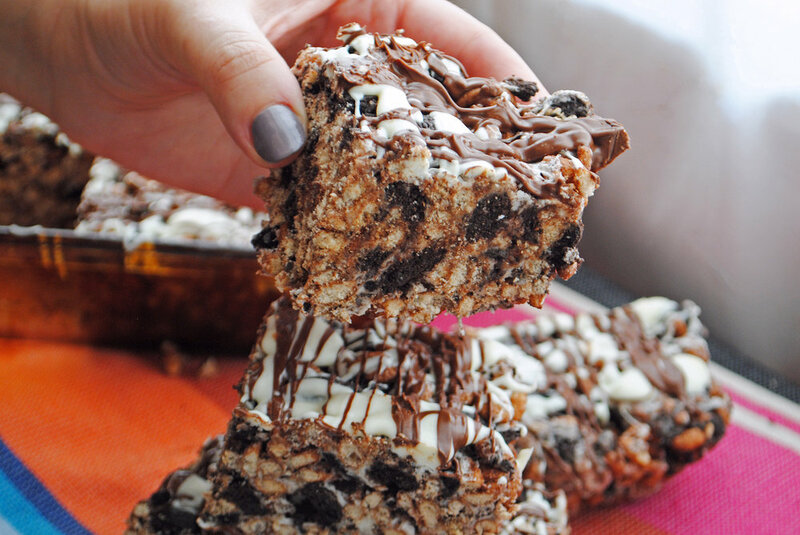 But when Rina and I were deciding what to make this week, I immediately said "Rice Krispie Treats." It was one of those unusual days where our vending machine was well-stocked. I'm one of the few members of my family who likes marshmallows. Of course, I'm hardly ever known as one who turns down dessert, but there's nothing more appealing on a summer night than a toasted marshmallow made right then and there over an open flame. Maybe it's the nostalgia of eating Rice Krispie Treats as dessert when I was a kid, or maybe it's this undying need for gooey over-sugared eats, but either way I knew we had to jazz these treats up the minute we decided to make them. Cookies & Cream. AKA Oreo. Two of my favorite childhood processed treats rolled into one dessert. Drizzled with chocolate (both white and dark) for extra effect. On a rare warm day this past weekend, I took these treats with me to a picnic in the park with friends. While everyone and their mother had half a mind to lay out a blanket and hang out in the spring-like weather, I have to say these treats were the perfect picnic compliment, despite the crowds (and my mindless 20 minutes of roaming frantically trying to find my friends on the Great Lawn with horrible cell service). As winter fades way to spring, and New York struggles to make up its mind about the weather, more and more impromptu picnics, rooftop potlucks and summertime celebrations will be popping up. A good guest never arrives to a party empty handed, so let us help you out. Ditch your sad prepackaged dessert, and take 10 minutes out of your day to make these. Trust us! Have we steered you wrong yet? Prep: grease a 9 x 13 baking pan with butter and set aside. Deb uses an 8-inch baking pan, so that can be used as well. Chop up the sandwich cookies into small chunks and add to a large bowl, along with the cereal. Mix and set aside. In a large pot melt the butter over medium-low heat. Once completely melted, add in the marshmallows and salt and melt until they become one smooth, homogeneous mass. It will look and feel like one giant, slightly melted but still super thick marshmallow. Once totally melted, stir in the cereal/cookie mixture and mix until totally combined. Immediately press into the greased baking pan, using some waxed paper sprayed with cooking spray to mold it into the corners (excellent Deb tip). Melt the bittersweet/semi-sweet chocolate and white chocolate in separate bowls in the microwave in 15-second installments. Add a teeny tiny bit of coconut oil to each chocolate to help it set before nuking. Drizzle artistically over the treats and place in the fridge until set. Cut into squares of whatever size you want and go to town. To keep: this will keep well in a tightly-sealed plastic bag or container for a few days, but leftovers will never be the case here.